The American Arts & Crafts movement began producing decorative objects around the turn of the 20th Century. Influenced by British reformers such as Morris, Mackintosh, Ashbee, and Ruskin, American Arts & Crafts workers shared the basic tenets of the movement -- simplicity, hand craftsmanship, a love of nature, and a rebellion against the fussy, mass-produced, over-ornamented Victorian style. "'I always call it the Arts and Crafts period. In the early years you see the Art Nouveau influence, and toward the end there are objects that look very Art Deco. The Boston people tended to work in gold, with a finer, more precious kind of jewelry, while the Chicago styles are bolder and are frequently worked in silver with semiprecious stones… Some of the pieces are little works of art." The best example of this is probably Chicago's Kalo Shop which was in operation far longer than most other Arts & Crafts metalcrafters -- from 1900 to 1970. Early Kalo holloware was often angular, paneled, almost architectural -- but this gave way to a more curved, flowing, sensual style. Early Kalo jewelry exhibited flowery, delicate Nouveau forms or Jugendstil-inspired geometric shapes, but Kalo artisans gradually adopted their own style based on nature and Scandinavian motifs. All of it is commonly referred to as Arts & Crafts, because of its roots and celebrated hand-craftsmanship. Much has been written about Arts & Crafts furniture and pottery. Pioneers in these fields such as Stickley, Limbert, TECO's Gates, Newcomb, Ohr, Grueby, Hubbard and the Roycrofters, Van Briggle, and Rookwood Pottery's Nichols and Taylor, are all well known. However, Arts & Crafts metalwork lags behind in popularity. 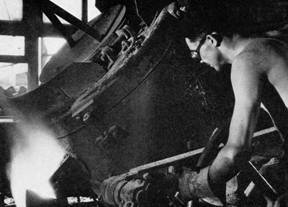 Apart from Tiffany and Van Erp, most metalcrafters from this period are unheralded. 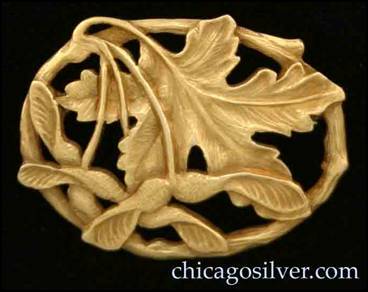 Arts & Crafts metalsmiths such as Clara Barck Welles, Heinrich Eicher, Edward and Gilbert Oakes, Frank Hale, Margaret Rogers, and Horace Potter (see maple leaf pin below) created wonderful objects but languish in relative obscurity. 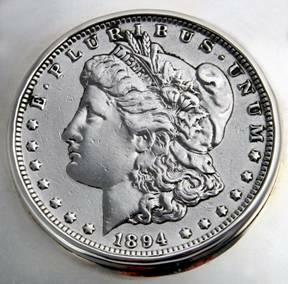 Especially odd is the lack of appreciation for items made from silver or gold (or even aluminum). Many Arts & Crafts dealers feel the dark patina of copper is more in keeping with fumed oak furniture and the gloomy interiors of the day, and best represents the rustic, communal underpinnings of the movement. To them it is preferable to put a pedestrian copper Roycroft bowl on a Stickley sideboard rather than a lovely one handwrought in sterling silver by the Kalo Shop. Copper has a place in the Arts & Crafts pantheon, but so does silver. Influential and well-to-do families purchased and displayed silver items, not copper ones. 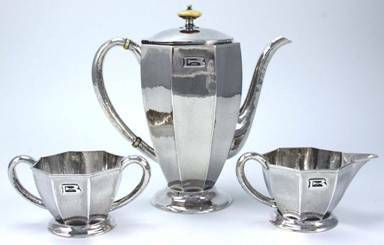 In fact, some of the finest work of the Arts & Crafts movement was done in silver by makers such Kalo, Lebolt, Randahl, Mulholland, Novick, and Jarvie. Arts & Crafts makers in Chicago had their own distinct identity. The Art Institute of Chicago noted in its Windows on the West (artic.edu/aic/exhibitions/window/themes.html) exhibition: "As craftsmen on the East Coast found inspiration in medieval examples of furniture and colonial silver, the Arts and Crafts community of Chicago looked to nature for artistic inspiration -- the prairie landscape and its grasses and flowers. After the 1893 World’s Fair, these artists also incorporated the earth colors, organic designs, and abstracted linear compositions of Native American art." Today those colonial and medieval pieces can look dated, while many Chicago designs seem timeless and classic. The best Arts & Crafts metalsmiths in America worked in Chicago, Boston, Cleveland, and Newark, NJ from just before 1900 to the 1920's. To many experts, this brief period was the golden age (or maybe the silver age) of metalwork in America. While a few other areas also produced fine pieces -- New York with Zimmerman and Smed, California with Friedell and Blanchard (see below), and others in Minneapolis, Asheville, Dayton, Grand Rapids, and Seattle -- Chicago makers' work was unrivaled in quality and quantity. 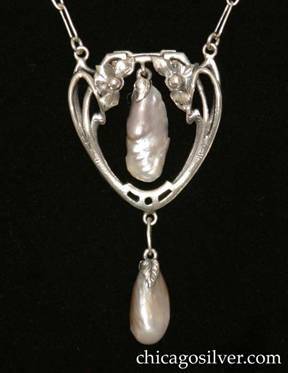 This site focuses on Chicago, especially The Kalo Shop, America's longest-lived and best silversmith operation. It will eventually cover jewelry, holloware, and flatware (as soon as we can photograph it all). 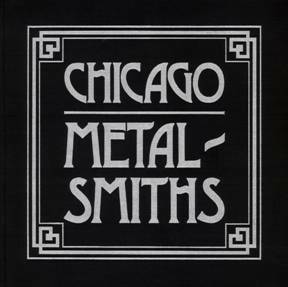 For additional information on Chicago metalcrafters from Sharon Darling's landmark reference and 1977 exhibition, click here. From "How silver is made"
If you would like to have your items shown here, or want to buy or sell Arts & Crafts metal items, please contact us.